TO EAT; The food was just my oh my amazing! Bloody hell do they know how to brew a good hummus. Hummus and pita probably being their most common food and they do it well. Hakomsa falafel – falafel and pita … enough said. It’s amazing. 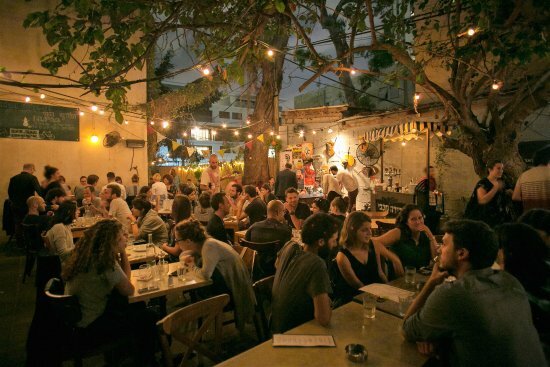 Old man and the sea – In Jaffa this place has lots of small plates to taste and share. Carmel Markets – explore the Yemin neighbourhood nearby and wander through the markets eating local produce. Abu Hassan – one of Israels oldest and most famous Hummus restaurants. Expect yelling and aggressive service and no menu but holy hummus it was INSANELY GOOD ! Cafe XOHO – for turmeric lattes, smashed avocado and homemade gluten free bread that actually tastes great. Hamanya Cafe – acai and smoothie bowl heaven when you’re sick of pita and hummus. Cafe Noir – we didn’t make it here but it was on all my recommended lists. It is opposite the Norman Hotel which people raved about so might be worth a sticky beak. Goocha – one of the best seafood restaurants I’ve been to. The seafood pasta is great and the grilled octopus and calamari are fab. Port said – funky bar and restaurant in the Rothschild area. Small portions great for sharing. The slow cooked beef cheek was tops and made sure you order the eggplant dishes. Dellal – in a beautiful area close to Jaffa, with a cute courtyard for lunch. Get ice cream from Anitas after it’s close. Bicicletta – awesome restaurant with great local food and a really cool outdoor courtyard space. The fried cauliflower was heavenly and the pita with black-eyed pea and tahini was mmmm…..
Anita’s – insane frozen yoghurt topping options and the gelato shop just across the road is divine. Anita knows her stuff. Flavours I have never seen before. Tamara yoghurt – frozen yoghurt heaven. They even do soft serve style acai bowls which was jaw dropping. Kuli alma – this place was amazing but unfortunately due to a Jewish holiday was completely dead quiet. Great venue though. Sputnik – not as cool as Kuli Alma but seem to be where the party was at. Expect a smaller room with electronic music and everyone smoking so your eyes will sting and your hair will smell like a fire pit. Maybe you need to be drunk to enjoy these experiences … not for me. Jasper Johns – super cool bar that seems only locals would know about. Great vibe, Dj and awesome drinks. The bar staff brew their own spirits (we had a Vodka coffee brew and it was heaven). You can get a table and sit around and order some food too. Much nicer vibe although apparently the real party doesn’t kick off until 2am in Tel Aviv. THE BEACH; comes alive at every hour of the day with a mix of runners, walkers, gym junkies doing chin ups, crazy flexible men doing acrobats, tightrope walkers, headstand practice and beach volleyball. The sun sets over the ocean and the beach is the perfect place to sit back and enjoy it. You can rent those city bikes and cycle up the coast or from the main Tel Aviv beach up to Jaffa the old town. It takes an hour to walk or about 25-35 mins to cycle. JAFFA; old town is great for markets, sitting back and having some coffee or drinks, wandering the alley ways and small streets and people watching locals. It’s very different to the city centre. Go to the flea market for a wander and have coffee or drinks at Shaffa Bar. Now this is a must do if you visit Tel Aviv. It was the most beautiful and interesting experience. We hired a car and drove about 2 hours through West Bank to the Dead Sea. West Bank is very eye opening and you pass many small desert towns and can see the struggle and conflict between the Israelis and Palestinians. Expect lots of police stopping you or controlling traffic and plenty of machine guns and barb wired fences. On the way back from the Dead Sea we took a different route through Be’er Sheva and the mountainous landscapes were stunning. The Dead Sea itself is huge. It takes over an hour to drive from the north or the south and the hotels are located on the south west Israeli side. We pulled our car up just south of Isrotel Hotel and found the perfect untouched spot to go floating. Hot Tips; Wear shoes you can wear into the water because the salt crystals on the bottom are very rough. Try not to sit and scratch your bum like I did because you’ll understand the true meaning of “rubbing salt in ones wounds” if you do. Ouch! As for tasting the Dead Sea – go for it, but take it from me it’s SO salty that it tastes acidic, or worse. It’s horrendous. But try it … yolo. Ok I’m no scientist but I’m going to get my fun fact on. The Dead Sea is made of 30% salt and therefore it’s impossible not to float. Once you walk far enough out your legs with white literally float out from underneath you and it looks as if you are lying in about 5cm of water. You don’t need to egg beater to stay afloat and for ladies with boobies, expect them to be up around your neck. Plus it is the lowest point on earth above water. Pretty amazing stuff. Another day trip that’s totally worth it. I’ve never seen a more religiously complex place. The old town or walled city is the most interesting part and the Western Wall in the Jewish quarter is worth going to see. The rest of old town is segregated into the Christian quarter and the Muslim quarter and each has a very unique feel. The markets are repetitive but nice to wander and the fresh juice stalls make a killer pomegranate and mango juice. The Mehrane Yehuda market is a large undercover food market with loads of local produce, spices, sweets and food stalls. We didn’t have time to explore but I was recommended it by some locals. I’ve heard the Israel museum is also great if you have time. MONEY; Tel Aviv is expensive (London prices) so as much as we wanted to wine and dine all day we definitely made instant coffee and yoghurt / muesli breakfasts at our apartment. The markets offer great fruit to snack on. They use the ‘shekel’ (nis) and most places have credit card payment options. TO STAY; We stayed in an apartment just off Ben Yehuda Street which was central and close to the beach. Great apartment, basic and everything you need. Sleeps 4-6 people. My only accommodation regret was not finding a place WITH parking. Tel Aviv is impossible to find parking so if you plan on getting a car this might be important to you. PARKING; if you have a car the blue and white striped curb is available for parking and the hours writing in Hebrew on the sign are the hours you can park for free. The hours outside of these times you must pay using their parking app. For ex. 17:00 – 9:00. Means you can park for free during those hours but must pay or move your car by 9am. The parking inspectors are out to play so be careful. The red and white striped curb means no parking full stop. Although you’ll see many people doing it. PASSPORT CONTROL; Before arriving in the country we were warned not to get our passports stamped. The lady at the passport control stared at me blankly when I asked for no stamp and said you don’t get stamps in Israel, and then grilled us about our reason for travelling there. Nonetheless you don’t need to worry about getting your passport stamped for future travel purposes. It is also safe to drink from the tap! So if you love hummus book your next holiday to Tel Aviv and Israel. It’s a very alive city with SO much to offer. Sunshine, pita bread and old town cocktails. You’ll love it!